Can Obama's Grass-Roots Army Win Missouri? 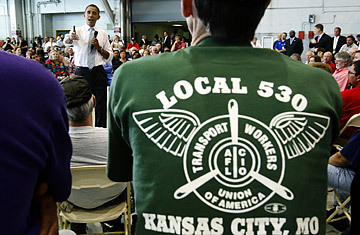 Senator Barack Obama in Kansas City, Mo. Can McCain Map Out a Comeback Strategy? Republicans in Missouri used to chuckle over the boasts of Barack Obama's grass-roots campaign, most notably the official claim to have 40 field offices, some covering the reddest and most rural regions of the state, and the unofficial whispers about having as many as 150 paid staffers. As the summer settled in and John McCain opened up what looked like a solid 5-to-7-point lead, Obama's investment of time and resources had Republicans and even some skeptical Democrats asking, Who are all these Obama staffers anyhow, and aren't they just wasting their time and the campaign's money? More recently, though, Obama's big bet on Missouri doesn't seem like such a joke. The latest St. Louis Post-Dispatch poll has Obama pulling within 1 point of McCain, and a new TIME/CNN poll has the Democratic nominee actually leading his Republican rival by 1 point among likely voters. The increasing tightness of the race  even if it's part of a national wave spurred by a focus on the faltering economy  shows why every doorbell, and every person ringing them, can make a world of difference in an election. Obama's strategists have long believed that a stronger ground game could turn narrow Democratic losses of recent years into wins. They note that Al Gore never would have needed Florida if he had instead built an organization to turn out an average of 15 additional votes per precinct in Missouri. Team Obama is also vowing to register 75,000 new voters in Missouri  and voter rolls are indeed swelling, up by 200,000 so far, though the secretary of state's office doesn't keep track of how many are Democrats or Republicans. The Obama campaign's commitment to every corner of the state is evident in rural Nixa, Mo., about a dozen miles south of Springfield and on the way to no place in particular. It sits in Christian County, which voted 70% Republican in the last presidential election. It's not the easiest part of the world to promote a candidate known for his statement that guns and religion might be the bitter psychological baggage of America's left-behind. Over the summer, state Republicans made hay of Obama's "field office" in Nixa, pop. roughly 17,000, which was but a table and chairs set up outside a vacant storefront. "Paid?" quipped former state GOP chairman Hillard Selck. "This could just be some guy who came out of retirement, sitting at a filling station handing out cards." But that once laughable table in Nixa is now a full-fledged office.